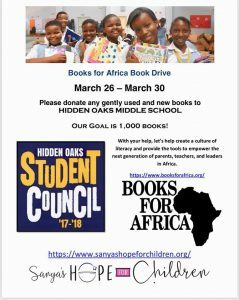 Please donate any gently used and new books to HIDDEN OAKS MIDDLE SCHOOL. Our Goal is1000 books- please help achieve our goal- 50 cents buys one book for a child. If you like to donate please visit https://www.sanyashopeforchildren.org/ or if you like to write a check to “Sanya’s Hope For Children” All donation are tax deductible. If you need more information please email us at info@sanyashopeforchildren.org.